No WP 8.1 for Samsung yet? Word is Samsung is planning to ship a new Windows Phone handset in April, but that it won't be packing Windows Phone 8.1 out of the box. The major Windows Phone update is expected to arrive during the month, but Samsung's next Windows Phone could be stuck on Windows Phone 8, according to The Verge. 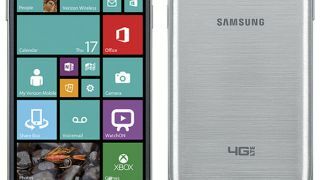 The site spoke with "sources" who said Samsung's new Windows Phone device, previously referred to as "Huron," will be called the Samsung Ativ SE, and that it will ship in April on Verizon. But while it may not arrive with WP 8.1 already installed, the update will go out for the handset when it's ready; Microsoft has already confirmed that all Windows Phone 8 smartphones will eventually be updated to WP8.1. Samsung has focused its efforts on Android lately, with its extremely successful Galaxy S series in many ways becoming the flagship for Google's mobile OS. The Korean company has for months been rumored to have a new Windows Phone in the pipeline, though most reports predicted it would launch with Windows Phone 8.1 this spring. The Ativ SE is said to be similar in specs to the Galaxy S4, with a 5-inch 1080p display, a 13MP camera, and the same brushed "metal" texture on the back (visible in the image above). In addition this report says it will sport a quad-core Snapdragon 800 chip, 16GB of storage, 2GB of memory and a microSD slot. Expect to see much more of the Ativ SE in April.